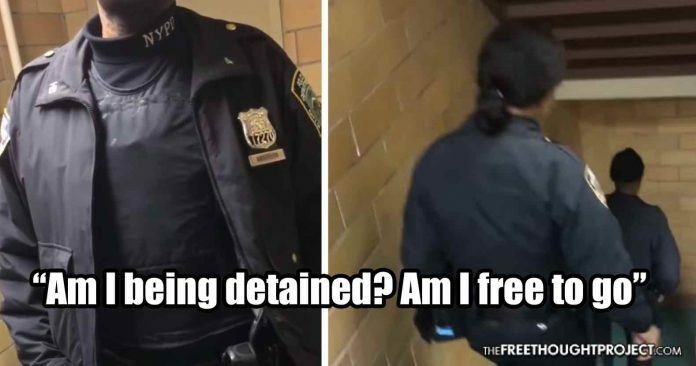 New York, NY — A video was shared with the Free Thought Project that illustrates the power of knowing and asserting your rights when being harassed or otherwise interacting with the police. It also highlights the importance of filming any and all interactions with police. An unidentified teen was doing nothing wrong, had committed no crime, and was simply talking about baseball with a friend when police officers approached and demanded to see his id. As the NYCLU notes, if you are stopped or questioned by police, you should never talk to them. The group details four easy to remember points when interacting with police. The teen in the video was obviously well aware of these points and followed them to the letter. This was in spite of one of the officers, officer Anderson, bagde number 17270, attempting to provoke and escalate the situation. As the video begins, the officer confronts the teen who immediately started filming. The young men were simply standing in a hallway talking about baseball when the officers confront them. “You’re hanging out in the hallway,” says the officer, attempting to imply there is something wrong with that fact. When the teen tells them there is nothing wrong with what they are doing, the officer then says “we’ve been getting complaints,” clearly fishing for a reason to justify his stop. “What kind of complaints?” asks the well-informed teen. “What do you mean what kind of complaints?” the officer asks as he appears to be making up these alleged complaints on the fly. Having his authority questioned, however, did not go over well with officer Anderson who then became angry and combative. “We’re getting complaints about noise complaints,” the officer says before he begins demanding the teen’s identification. But the teen was not backing down. “Have I committed a crime? You don’t have to see my ID, sir,” the teen stated correctly. However, the officer continued to demand his ID knowing full well that he had no probable cause to do so. The cop claimed that he had the authority to see the teen’s ID in order to prove that the teen was not committing a crime. This is the epitome of what’s wrong with policing today. These kids were assumed guilty from the start and the cop tried to make it up to them to prove their innocence. But the teen was well-informed and was not about to have his rights trampled by the NYPD. This statement effectively shut down the officers who then realized they were dealing with someone who knows their rights. In fact, the cop was speechless for a brief moment before realizing they’d lost the battle. And, just like that, this teen had flexed his rights and the cops left them alone.